Railroadfan.com • View topic - Where Is It? lolz, i see now that it was posted, whoopsie. I usually try to do a search for names like Quaker before posting, forgot to do so this time. Here's another, where be it? I searched this thread for the two cross-streets here, neither are mentioned so hope it hasn't been posted. Another in what the westsiders would call Detroit, aka all of your suburbs. Found it! At Gallapher and Jerome streets. the southwest end of the old Detroit Terminal RR main line looking eastnortheast towards Ryan Road and the Ryan Correctional Facility in Detroit, Wayne County. now part of the Conrail Share Assets industrial spur to the connection with Conrail Share Assets North Yard. Is this in Livonia? One of the spurs off the CSX Detroit Sub? ~Z~ wrote: Here's another, where be it? I searched this thread for the two cross-streets here, neither are mentioned so hope it hasn't been posted. Another in what the westsiders would call Detroit, aka all of your suburbs. ~Z~ wrote: lolz, i see now that it was posted, whoopsie. I usually try to do a search for names like Quaker before posting, forgot to do so this time. Where be it? ROW goes along this driveway past the elevator. Track is in use about a mile southwest of this spot. ~Z~ wrote: Where be it? ROW goes along this driveway past the elevator. Track is in use about a mile southwest of this spot. Draw a circle of 30 miles around chesaning and this spot will land inside of it. ~Z~ wrote: Draw a circle of 30 miles around chesaning and this spot will land inside of it. Found it!! The Rogers Elevator in Rogersville, MI looking northeast along the ROW of the former Pere Marquette Railway, later Chesapeake & Ohio Railway, Otisville Branch to Otisville, which is located on M-15. The road barely in the foreground is Vassar Road. The northeast end of the Huckleberry Railroad is a mile southwest of the above shot, in Rogersville, Richfield Township, Genesee County. Rogers ( Rogersville) Elevator was one of the five rail customers on the Otisville branch. The other four rail customers were as follow: 1) Old Shell fuel storage facility at NE corner of Dort Hwy and the track. 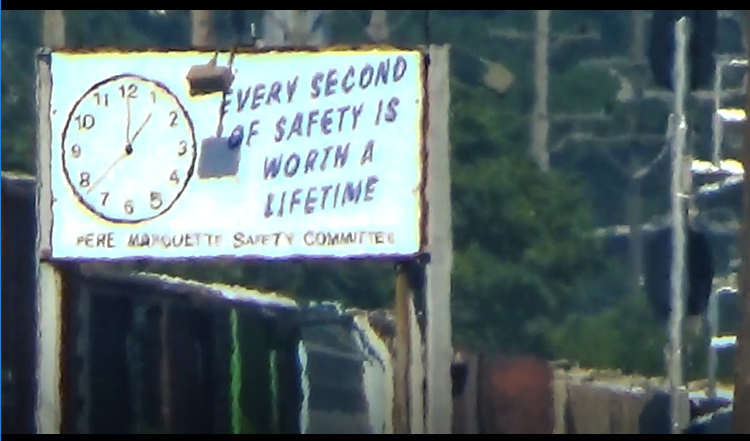 2) Genesee Lumber Co yard at NE corner of Genesee Road and the track in Genesee. 3) old gravel pit spur south off the Otisville branch, just south of E. Mt. Morris Road, near the Genesee County fairground. 4) Rogers (Rogersville) Elevator. And 5) Otisville Coal Co yard at SW corner of M-15 and the tracks. The ROW, just west of M-15 is now part of the Rite Aide Pharmacy's parking lot. The Otisville branch was abandoned in 1972. Last edited by railrod1949 on Sat Aug 04, 2018 10:46 am, edited 4 times in total. The locomotive ought to date the picture. This one might be easy. Looks like one of the old paper mills in Kalamazoo, at Alcott St. Can't remember the name of the plant but it was just north of South Yard on the Kalamazoo Secondary. I used to get paid for doing what all of you like to watch! Hogger1225 wrote: Looks like one of the old paper mills in Kalamazoo, at Alcott St. Can't remember the name of the plant but it was just north of South Yard on the Kalamazoo Secondary. Allied Paper. That's the power house in the distance. Mill C was to the right along Alcott St. Mill D was to the left. The pipes running overhead went to Mills A & B which were south of Alcott. Yes, indeed, that's Allied Paper on both side of East Alcott Street,looking north. The exLS&MS, later NYCS, Penn Central, later Conrail, later N&W, now Grand Elk RR main line, is at the left, not visible. The Allied Paper rail spurs was off the connection with the former Conrail, just south of East Alcott Street. All in Kalamazoo, Kalamazoo County.